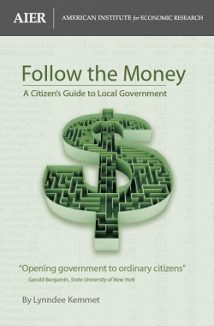 The American Institute for Economic Research publishes Follow the Money: A Citizen’s Guide to Local Government by Lyndee Kemmet. It is an excellent introduction on how to understand your local municipal budget process as well as how to get involved. Kemmet has a wealth of experience reporting and working with local government and is an excellent writer. For those of you who want to take advantage of local opportunities as our economy changes but find local government and budgets baffling, this book is for you.